A sadistic game but a popular one on iPhone, iPad and iPod Touch has finally arrived for Android smart phones and tablets. 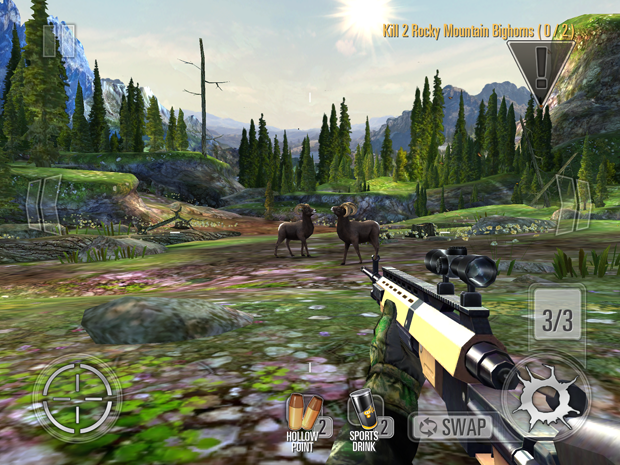 The Deer Hunter 2014 is a FREE hunt them down game in which you shoot to kill. Yes it is a shooting game where you hunt down the animals. You get a gun and a infrared scope to hunt them down but the targets keep getting difficult as you progress through the different missions. Each Deer Hunter 2014 mission has a target in which you have to a certain number of animals with a shoot to kill shot or Ace shot. Your success unlocks next mission and earns you plenty of Hunter bucks. The flip side is that each mission you embark on costs energy. This is where the Hunter money comes into play. The game has different play modes like Hunting Series, Contract Hunts, Club Hunts (co-op multiplayer), or the more unique Trophy Hunts. The game is a bit gory but addictive at the same time and if you dont feel squeamish at shooting at animals (some endangered ones too) you can download this free game from Google Play for your Android smart phone and tablets.